The Garden Moth Scheme is a Citizen Science Project of moth recording which has run for 12 years. Light traps are run in gardens, each Friday. The presence and abundance of the easiest to identify garden moths is recorded then collated by Regional Co-ordinators and analysed on a National basis. The 2019 GMS Annual Conference was held at Bamford Institute and was well attended, including several DaNES members. Commercial supporters were Atropos Books, Hachiware Art and equipment suppliers Watkins and Doncaster. Norman Lowe started with a GMS 2018 round up. The top 10 most common moths are Large Yellow Underwing, Heart and Dart, Dark Arches, Setaceous Hebrew Character, Hebrew Character, Common Quaker, Light Brown Apple Moth, Lesser Broad Bordered Yellow Underwing and Garden Grass Veneer. Results have shown that Moths such as the Heart and Dart which used to have one generation a year now have two generations a year, one in Summer and one in Autumn. Zoe Randle, Surveys Officer of Butterfly Conservation introduced the new Moth Atlas which is under production and will be available in Summer 2019. The Atlas will include distribution maps, Distribution trends and Abundance trends. The East side of the UK clearly had the least moths recorded. The 20th National Moth Night to be held over 26-28 September 2019 (Sponsored by Atropos) will focus on Migratory Moth Species. Stephen Rutherford of the British Naturalists Association then introduced the topic of Phenology – the timing of natural events. Spring moths now emerge 3 weeks earlier, but Autumn moths emerge 3 weeks later. The effect on ecological networks is that early emergence has more serious consequences for animals further up the food chain, so that plants may already be past the bud stage by the time that insects emerge to lay their eggs, birds which lay eggs when caterpillars are abundant, show a time lag in adaptation to the new circumstances. Predators such as the sparrowhawk are even more out of sync and their numbers are reducing. The cuckoo returning in Spring, which used to parasitise dunnocks now miss the crucial egg laying period, but they have adapted to lay their eggs in reed warbler and sedge warbler nests, so a woodland bird has now become a bird of wetlands. The longer summer season has benefited the swallow which now stays longer and may raise 2 broods. Stephen then addressed the issue of biodiversity, illustrating the benefit of the management of woodlands by conservation organisations. By blocking drainage and leaving dead wood, a variety of insects follows. Apparently the honey bee with its shallow mouth and short tongue is not a good pollinator, but moths, bumble bees and other bee varieties, beetles and flies are very important pollinators, not forgetting fungi which soften plant material so that it can be ingested and recycled by insects. Stephen encouraged us all to have untidy gardens with long grass and plenty of leaf litter. By education young people can be made aware of these issues, that getting dirty doesn’t matter and it is good to be GREEN. Contact norman@enviro-consulting to book your place. Comments Off on What Moths Have You Got in Your Garden? Insects have a chitinous exoskeleton, a three-part body (head, thorax and abdomen), three pairs of jointed legs, compound eyes and one pair of antennae. Nearly all insects hatch from eggs. Constrained by the rigid exoskeleton, insect growth involves a series of moults. The immature stages differ from the adults in structure, habit and habitat, and can include a passive pupal stage in those groups that undergo four-stage metamorphosis. Insects that undergo three-stage metamorphosis develop through a series of nymphal stages. More than 90% of lifeforms on earth are insects, the number of described species is possibly more than a million. Of the 24 orders of insects, four dominate in terms of numbers of described species, with at least 670,000 species of beetles, flies, wasps and moths. Insects are an important part of food chains and food webs, they can recycle any type of organic matter (eg dead leaves, decaying animals) as food. Amphibians, reptiles, birds and mammals including humans, feed on insects. Insects have good methods of dispersal and are an important part of nearly every ecosystem. A lot of people think that all insects are pests, but only a very small percentage are pests. 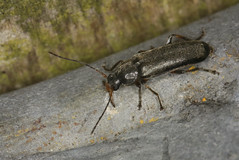 Some pests are herbivorous insects that have taken advantage of modern farming practice. Farmers now have large fields of just one crop. These grow fast due to the application of fertiliser and water, so do not have any resistance to insect attack. To provide food security, farming practice should develop stable, resilient and sustainable systems which incorporate a variety of insects which perform essential ecosystem services. One of the most important services that insects provide is pollination, insects have co-evolved with flowering plants. Insects form important ecosystem linkages between predators and prey. Hosts and parasites. They provide control systems of the environment. An entomologist is a person who studies insects. Insects are ecosystem health indicators. By studying their response to environmental changes we can predict, diagnose and advise how to resolve problems! Comments Off on Why are Insects Important? Now that Autumn is here there don’t seem to be many insects about, so I have been looking at Woodlice. There still seem to be many of these Pill Bugs, Slaters, Hog-lice or Sowbugs (call them what you will), under logs and stones, sheltering from the drying wind and keeping close together to conserve moisture. Although they are mostly terrestrial or land-living, Woodlice are Crustaceans, related to Shrimps and Crabs. Woodlice have a segmented, flattened body with 7 pairs of jointed legs, two pairs of antennae (one pair is small) and two compound eyes. Under the abdomen there are two pale ‘pseudo-lungs’, connected with pores to the outside air. The ‘tail’ is a small telson flanked by two uropods. The exo-skeleton is hard and brittle and must be progressively shed as it grows. The moult takes place in two stages; the back half is lost first, followed two or three days later by the front. Females carry fertilised eggs in a pouch, providing embryos with water, oxygen and nutrients. Juveniles then go through a series of moults before reaching maturity. They are usually nocturnal and are attracted to dead plant matter, feeding on the bacteria and fungi which cause decay. They may also graze lichens and algae from tree bark and walls. Despite being crustaceans related to lobsters or crabs, woodlice are said to have an unpleasant taste to humans, but they are eaten by a wide range of insectivores (shrews, toads, centipedes and carabid beetles, and even some birds), the woodlouse spider Dysdera crocata preys exclusively on woodlice. Woodlice, like earthworms, are beneficial in gardens for their role in controlling pests, producing compost and overturning the soil. There are over 45 native or naturalised species of woodlouse in the British Isles, ranging in colour and in size (3–30 mm). Only five species are common, have you heard of the Famous Five? : Oniscus asellus (the shiny woodlouse), Porcellio scaber (the rough woodlouse), Philoscia muscorum (the striped woodlouse), Trichoniscus pusillus (the pygmy woodlouse), and Armadillidium vulgare (the pill bug). Philoscia muscorum, the striped or fast woodlouse, is common. It’s 11mm shiny body is mottled greyish-brown with a dark head. It runs faster than other species; its body raised up off the ground. 12 sub-species are recognised. Oniscus asellus, the common shiny woodlouse, is widespread and common, and grows to 16 mm. It is relatively flat, and is a shiny grey-brown. It occurs in a wide range of habitats, including some with little available calcium. It is chiefly found under stones, and on rotting wood. It is the only woodlouse regularly found on heather moors. Porcellio scaber, the common rough woodlouse, has an oval body, up to 20 mm long, and is usually purple-grey. It’s upper surface is covered in a series of small tubercles. It lives in a wide variety of damp habitats but it is less dependent on high levels of humidity than Oniscus asellus. Porcellio scaber is a ‘clinger’ and adopts a posture of tonic immobility when faced with the threat of predation. Trichoniscus pusillus, the common pygmy woodlouse, is the most abundant woodlouse in Britain. It may be distinguished from other British woodlice by it’s rounded and elongate dark red body and it’s small size, 5 mm, but several former subspecies of T. pusillus are now treated as separate species such as T pygmaea. There are two distinct reproductive strategies within the Pygmy Woodlouse. Many are bisexual and reproduce sexually; in other cases, females reproduce parthenogenetically, creating clones of themselves. The frequency of males in the population decreases from south to north, with no males observed in most of Scotland. Armadillidium vulgare, the (common) pill-bug, is widespread. It is the most extensively scientifically investigated woodlouse species. Growing to 18 mm, it rolls into a ball for defence. It can be confused with pill millipedes such as Glomeris marginata but millipedes have 2 pairs of legs per body segment. It can be distinguished from Armadillidium nasatum and Armadillidium depressum, the only other British species in the genus, by the gap that A. nasatum and A. depressum leave when rolling into a ball; A. vulgare does not leave a gap. Armadillidium vulgare is able to withstand drier conditions than other woodlouse, and is more restricted to calcareous soils or coastal areas. Woodlice live for 2-3 years. Some people think pillbugs are cute and keep them as pets but their role in recycling organic matter and maintaining healthy soil structure is probably under-rated. Comments Off on Are Woodlice the Cinderellas of the Animal Kingdom? The Friends of Toton Fields Local Nature Reserve invited LENS to go wild as part of a ‘Toton Go Wild’ Biodiversity Day organised to celebrate the publication of their new book ‘Wild About Toton’. This Local Nature Reserve is owned by Broxtowe Borough Council and was declared in 2009. It is managed by Broxtowe Borough Council and Nottinghamshire Wildlife Trust. The site is characterised by amenity grassland, small areas of ash/ willow / poplar plantations, and scrub habitats next to the River Erewash. In 2018 two large ponds were dug and a butterfly bank constructed. We have been here before so we chose a new site close to the bridge over the River Erewash overflow, in long grass near an apple tree and sallows, by the path that leads to Mayfield Grove, Long Eaton. It was accessed from the Greenwood Centre at Chester Green. Skinner design moth traps were used, which consist of a wooden box with a central wooden crossbar housing a bulb holder and rain guard. Two large, angled pieces of clear Perspex have dual purposes, deflecting moths downwards, and allowing easy visual inspection to find moths which settle into the empty egg boxes which are placed in the box. A 125W mercury vapour (MV) lamp light source was used. The LENS trap was placed out of the line of sight of other traps (5 lights were operated by DaNES and are the subject of a separate report). Light traps were run for 3 hours, it had been a sunny day, but the temperature dropped rapidly in the evening and the moths struggled to get airborne. By the end of the evening, 32 types of moth were trapped and identified but the numbers were low. The cool temperature had inhibited flying by the end of the session. Many of the species caught were those that inhabit damp and marshy places and woodland. The most numerous were the Water Veneer, Square- spot Rustic, Large Yellow Underwing and the Straw Dot. The larvae of the Water Veneer Acentria ephemerella are entirely aquatic feeding on waterweed. The Straw Dot Rivula sericealis is a common resident and suspected immigrant which feeds on grasses in damp meadow and woodland however it has only become common locally in recent years. The Large Yellow Underwing Noctua pronuba is a ubiquitous resident and immigrant species which feeds on a wide range of herbaceous plants and grasses. All species recorded in the United Kingdom have been given a national status with the most threatened and scarce species assigned to a conservation category, as listed under ‘National status’. Accurate up to date and properly vetted information is difficult to come by the most recently compiled national distribution maps may not include the most up to date information. The Old Lady Mormo maura is a large-winged, sombre-coloured moth, which is distributed locally throughout much of Britain, and common in places. It hides by day in old buildings and sheds, and frequents damp localities as well as waste ground and gardens. The adults are on the wing in July and August. The caterpillars feed in the spring after overwintering, on blackthorn (Prunus spinosa), and other shrubs and trees. The Old Lady moth has LOCAL status ie records are localised or patchy. All the other macro-moths recorded were COMMON ie well distributed . Several micromoths were taken to be identified by Dave Budworth, the Derbyshire Micro-moth recorder. Previous moth trapping sessions at Toton have recorded Beautiful Hook-tip Laspeyria flexula, Sycamore, Chocolate-tip Clostera curtula, Coronet Craniophora ligustri, Scarce Footman Eilema complana and White-streak grass veneer Agriphila latistria (a micromoth). These are moths of LOCAL status with localised or patchy records, Notts Grade 3. The Angle-striped Sallow Enargia paleacea recorded in 2017, is Nationally notable, Notts Grade 2. Dot Moth Melanchra persicariae BAP Priority Species declined by 88%. Day flying moths which are common in this area are Shaded Broad-bar Scotopteryx chenopodiata BAP Priority Species declined by 88%, Blood-vein Timandra comae (79% decline) and Black neck Lygephila pastinum Conservation Status Local Notts Grade 3. Six belted Clearwing Bembecia ichneumoniformis Local Notts Grade 2 has also been recorded on Toton Sidings (2015) nectaring on ragwort. The larva of the Toadflax Brocade Calophasia lunula has been recorded on the south end of the Toton Sidings Site at Long Eaton in 2018, the adult was trapped on the Long Eaton side of the River Erewash in 2016. Although it’s high BAP priority was downgraded in the 2007 national review, it is an uncommon moth more usually found on the south coast. Waved Black Parascotia fuliginaria (Notts Grade 1, Nationally Scarce B) is another notable moth which has been trapped nearby. Red Swordgrass Xylena vetusta Nationally local, Notts Grade 2 is thought to be an immigrant species. Nationally local, Notts Grade 3 species trapped just over the border in Long Eaton include Silky Wainscot Chilodes maritimus Large Twin-spot Carpet Xanthorhoe quadrifasciata, The Tissue Triphosa dubitata, Lilac Beauty Apeira syringaria, Dark Umber Philereme transversata, Yellow-barred Brindle Acasis viretata and Dwarf Cream Wave Idaea fuscovenosa. Northern Spinach Eulithis populate is Notts Grade 3 but nationally common. According to Butterfly Conservation https://butterfly-conservation.org/files/1.state-of-britains-larger-moths-2013-report.pdf the total abundance of moths decreased by 28% over the period 1968-2007. Losses in southern Britain were greater, at 40%, whereas in northern Britain losses were offset by gains. Although many of the widespread and common larger moths decreased in abundance during the 40-year study, a substantial minority (one-third of the 337 species studied) increased. Fifty-three species more than doubled their population levels over the 40 years Many of the species that have become more abundant have also become more widespread by expanding their distributions, dramatically in some cases. An example of this is Vine’s Rustic Hoplodrina ambigua, a resident and immigrant species found in a wide range of habitats and recently recorded in Toton. It’s population levels have fluctuated from year to year, as expected of a migratory species, but show an increase of 433% over the 40-year period of the report. In keeping with this increase, the resident distribution of the Vine’s Rustic has expanded. However, twice as many larger moths declined as increased in Britain over 40 years. Moths come in a huge variety of sizes, colours and shapes but most are rarely seen because they fly at night. There are 2,500 species of moths in Britain of these approximately 800 are macro-moths, the majority are very small and are called micro-moths. Most live here all year, but some visit on migration. Moths have important roles in the wildlife ecosystem. They pollinate flowers and are vital food for many other animals. Moths are also useful to us, giving vital information about our own environment, especially climate change. The world is facing a biodiversity crisis with profound consequences for human wellbeing. The decline and extinction of species is occurring at a rapid rate. The results are unequivocal: insect biodiversity is declining rapidly and, in many cases, it is specialist species that are being lost, while a relatively small number of generalist species come to dominate wildlife communities which then are less resilient to change. Light pollution has long been recognised as a potential problem for moths and other wildlife and this, in addition to agricultural chemicals, increased nitirification of the atmosphere and rivers, habitat destruction and climate change all affect biodiversity. There are significantly fewer individual moths in Britain now than 40 years ago and, while many rapidly declining moths are still regularly recorded in back gardens and other habitats across the country, their populations are markedly reduced. The moth trapping exercise has proven there is a valuable biosystem sink for a variety of moths of Local and National Importance at Toton Fields Local Nature Reserve, Toton Sidings and sites nearby in Long Eaton. Recently work has been carried out to increase the biodiversity of habitats available for colonisation in the River Erewash Corridor at Toton so it is expected that new species of moth for the area will be found in future moth trapping surveys. Fox, R., Parsons, M.S., Chapman, J.W., Woiwod, I.P., Warren, M.S. & Brooks, D.R. (2013) The State of Britain’s Larger Moths 2013. Butterfly Conservation and Rothamsted Research, Wareham, Dorset, UK. Some of you may already know that Stoney Clouds at Sandiacre is one of my favourite places. I have been there so many times to enjoy the panoramic view. But, earlier this year, I was introduced to more of Sandiacre’s Beauty Spots, the ancient hay meadows of Cloudside Farm and Sandiacre Marsh, a recognised wildlife site alongside Erewash Canal Bridge No 12, by Helen Thompson a concerned local resident. She is supporting ‘Save our Sandiacre Beauty Spot’ a local campaign aiming to minimise the effect of the proposed HS2 high speed train on it’s journey through the green belt between Nottingham and Derby. First of all we looked at the hayfield, it had been cut! But a channel running at the edge of the field revealed several unusual plants such as the shining buttercup flowers of lesser spearwort Ranunculus flammula, Tufted Forget-me-not Myosotis laxa, with tiny blue flowers, hoary marsh cudweed Gnaphalium uliginosum and the orange stamened flower heads of Marsh Foxtail Alopecurus geniculatus. Black heads up, out of the water were the barely branched stems of Marsh Horsetail Equisetum palustre. We climbed over a stile into a flooded meadow which was tufted with rushes, interspersed with sedges. The finely divided feather leaves of Common Water-crowfoot Ranunculus aquatilis were floating in pools and to our great surprise growing on the cattle-poached edges, the angular leaves of Ivy-leaved Water-crowfoot Ranunculus hederaceus, a very rare plant in the Erewash Valley. We were delighted to see dark green grasshoppers with black and white striped waiscoats, Meadow grasshoppers enjoying the sun. Bright yellow daisies of Marsh Ragwort Senecio aquaticus peered over the reeds. A long winged conehead, a female with a curved ovipositor played ‘peek a boo’ on the long hollow cylindrical stems. Two furry caterpillars chewed leaves, careful not to fall into the pools of standing water. Marsh Thistle Cirsium palustre, Skullcap Scutellaria galericulata, Water Forget-me-not Myosotis scorpioides, Brooklime Veronica beccabunga , Ragged Robin Lychnis flos-cuculi and Common Bedstraw Galium palustre, were just a few of the water loving wildflowers in this colourful mosaic. As we crossed Bridge No 12, we looked up to St Giles Church. This is a view that never palls. Helen showed us something special. On a still day the church is perfectly reflected framed in the classic arch of the eighteenth century canal bridge. A narrow boat, chugged it’s way to an evening mooring as we walked along the Erewash Canal towpath to Sandiacre Marsh. Now colourful canalside flowers captivated our eyes. Glowing orange jewel weed Impatiens capensis amid the flounced leaves of Gipsywort Lycopus europaeus, Blue Skullcap flowers Scutellaria galericulata (the white seeds like little skull caps), ray-less yellow discs of Bur-marigold Bidens tripartita and the bright green spiked fruits of branched bur-reed Sparganium emersum with burnt tipped spear-shaped leaves edging the canal. Striped pike hid beneath the Water-lily pads with yellow waxy flowers Nuphar lutea, purple eyed flowers peeped between the distinctive leaves of arrowhead Sagittaria sagittifolia and the beautiful pink umbels of flowering rush. Butomus umbellatus. We turned into the dark marsh, where large willows were gracefully reclining. A smattering of Himalayan Balsam Impatiens glandulifera , that pretty pink, tiresome alien plant, and fluffy waving heads of Common Reed Phragmites australis. Great Yellowcress Rorippa amphibia surrounded large remnant pools covered with Lesser Duckweed Lemna minuta. It was very shady but we found Cornmint Mentha arvensis, Wild Angelica Angelica sylvestris, Skullcap Scutellaria galericulata and, a delightful surprise, Enchanter’s Nightshade Circaea lutetiana. Helen wanted to know if there were any bats, so that evening we went out with our bat detectors. It was a fine warm night and the bats were busy feeding. We counted the bat chatter picked up on our detectors,from Sandiacre Lock Cottage keeping moving, so we didn’t count them twice. Springfield Mill was all lit up. Two large bats near the Mill were brown long eared bats, ‘ the quiet bat’. The straight flight of a bat along the surface of the canal may have been a Daubenton’s bat. The others were a mixture of common and soprano pipistrelles A Bat Group might carry out a survey in which they would record the bats and give a reliable identification but in all, we counted 50 bats, with a higher concentration in the area of Sandiacre Marsh. It would be such a shame to lose these lovely sites with their fragile wildlife communities. Helen feels the proposed new flyover for the HS2 train might devalue the recuperative powers of the timeless 18th Century landscape, so many people use the Nutbrook Trail and the Erewash Valley Trail cycling and hiking links to ‘Get Away From It All’. In Autumn the HS2 Environmental team joined us in a walk around Sandiacre Marsh, they were able to highlight the local wildlife site on the HS2 plans. The team showed a real appreciation of the biodiversity value of Sandiacre Marsh and hope to use the opportunity provided by HS2 to improve the amenity value of the area. LENS Meet 7pm at Aston Brickyard Plantation. When coming from Derby Road, Thulston, it is on the right after the Aston on Trent sign DE72 2AY. Leader Ken Orpe Butterfly Conservation. Have you ever thought about being a butterfly recorder? This is how our evening with Ken Orpe started. Ken is the Derbyshire Butterfly Recorder for Butterfly Conservation. He co-ordinates 100 different butterfly transects and keeps everyone up to date with his weekly newsletter. One of the transects Ken walks is at Aston on Trent Brickyard Plantation a 5a area of secondary woodland plus mixed woodland planting and a wildflower meadow on the site of a former clay pit and brick works, owned by Derbyshire County Council. Since 2012 it has been managed by FAB, a great acronym for the Friends of Aston Brickyard Plantation! At the entrance is an old office (very similar to a railway goods office) two wych elms here are where White Letter Hairstreak butterflies can be seen dog fighting in June. Ken proudly showed us a butterfly bank which had been constructed from sub-soil with a topping of limestone chippings donated by Longcliffe Quarries. It sits at the north end of the meadow and has been planted with cinquefoil for dingy skippers and bird’s foot trefoil for Common Blue and Brown Argus butterflies. A certain amount of ragwort is allowed to flower. The meadow is managed in two halves, grassland which is cut in alternate halves each September by a reciprocating mower, cuttings are raked off. The other half is a wildflower meadow where knapweed and field bindweed provide a nectar source for many insects. This meadow is kept clear of bramble and encroaching scrub. Derbyshire Wildlife Trust have marked sites for annual quadrat analysis of the species. There are two survey tiles at the edge, which we lifted, to see field vole nests beneath (last time there was a common shrew). Two wonderful carved benches have been donated by a FAB member. 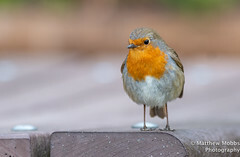 Photo posts allow cameras to take a shot from the same position through the seasons. At the woodland-meadow edge, alder buckthorn has been planted for brimstone butterflies, the caterpillars are so well camouflaged they don’t need to hide and can be seen feeding on the top of the leaves. Specimen trees of Ulmus -Sapporo Gold have also been planted. Arising from a chance crossing of the Japanese and Siberian Elm this has been widely planted due to it’s resistance to Dutch Elm Disease, but does it support White-Letter Hairstreak Butterflies? It is now known that white hairstreak caterpillars need elm flowers to eat when young, later moving onto the leaves so an elm tree has to be at least 5 years old before it can be colonised. Watch this space! No cut wood is wasted so the footpath edge is well defined by staked sticks and brash guiding us to the South Pole, where a circle of rustic seats are used for school visits. Autumn seems to have come early this year evidenced by red berries on the Cuckoopint. We were a bit jealous of FAB’s magnificent Bug Hotel and determined to have one at Forbes Hole. Rides have been created in the adjacent wood which is managed by the Archery Club. There are remains of old plaster pits in this wood and a wharf, where formerly gypsum was quarried and loaded into wagons, to be taken by tramway to the Trent and Mersey canal. The tramway closed about 1925. We puffed up towards a beaming sun at the top of Aston Hill where we enjoyed a panoramic view across farmland towards Derby and further to Minninglow, Crich Stand and Alport Heights. Ken explained how he had been responsible for an extra curve of the A50 which he had fortunately been able to have re-routed to save the woodland. There is a lot of sycamore in the woodland but also some mature oak trees, Ken is hopeful of attracting Purple Hairstreak butterflies. Wending our way to the pond it seemed, out of place. Ken explained that after the brickyards closed in the 1950s, the site had been used as a waste tip. This had been sealed before amenity woodland was planted. Derbyshire County Council are wary of penetrating the impermeable layer so FAB been allowed to create a pond at the more obvious damp hollow at the edge of the meadow. Instead, trees had been cleared and the pond dug in a shady area of woodland. Comments Off on Have You Ever Thought About Being a Butterfly Recorder? The focus of National Moth night 2018 was pyralid moths, which includes members of the Pyralidae and Crambidae families. The pyralid group of moths includes some of the largest and most distinctive of 1,600 micro-moths found in the UK. They occur widely, in a multitude of habitats, are often abundant and include day-flying and night-flying moths, which makes them very accessible to everyone. Trowell Marsh Local Nature Reserve was our chosen site. This Local Nature Reserve is a borrowpit, one of the holes dug in the ‘Boards’ during the nineteenth century in the construction of the embankment for the Midland Mainland Railway which forms the northern boundary of the reserve. The Boards is a local name for Trowell Marsh, said to be due to the boards laid to pass over the marsh by foot. The canal here is known as Stanton Hotwaters as it is very close to the old Stanton Ironworks site. Trowell Marsh has pools at the western end with diverse and uncommon wildlife. Crowded woodland separates the swamp from a floristically rich and marshy meadow. Despite the rash promise made above, a mesh net search revealed nothing except a few cinnabar moths so we determined to use our moth traps. Two sites were chosen, one on the boundary of the meadow and the wood, the other on the meadow, closer to the railway line. With the mercury vapour lamps on, we were sitting comfortably in our chairs in the exact centre of England watching two bats fluttering above the trees but the mercury in the thermometer zoomed down and it was cold, 14.2C at 20.00 hrs. A slow stream of moths arrived including common and light emerald whose larvae feed on woody shrubs and trees. Burnished brass, unmistakeable, with its shin metallic brassy yellow markings and which has a nettle feeding larva. We were surprised to attract latticed heaths (3) normally a day flying moth which feeds on clover. Our hawk-moth for the night was the Elephant Hawk-moth, which uses Rosebay Willowherb as a larval foodplant. A Peppered Moth was one of the last to arrive, in the white form peppered with black spots, the larva feeds on a variety of trees and shrubs. The highest number of one species was the more notable Beautiful Hook-tip (8), a nationally designated LOCAL species, which feeds on lichens growing on twigs and branches of trees. By the end of the evening although 35 species of moth had been identified only three of these were pyralid moths, the Small Magpie (4), the Mother of Pearl (1) which both feed on nettle and Eudonia lacustrata, the Little Grey, (1) which feeds on moss. The lights were turned off at 00.30 hrs by which time the temperature was below 10C. Brrr!! We felt that we had not done justice to the Nature Reserve due to the low temperature. So we grabbed another opportunity to run the moth traps. This was three weeks later and we were in the middle of a heat wave. At 20.00hrs the temperature was 23C! The traps were placed in the same position as last time. The moths were flying and 70 species were identified. There was a surprise visit from a giant click beetle, Melanotus castanipes and a tiny Agrimony Plume moth. Again the moth trap near the wood caught two hawk-moths but this time they were Poplar Hawk-moths. The overall numbers of moths were higher. The most common species was a pyralid moth, the Mother of Pearl (12) there were also many Little Greys but they were a bit too quick to count. Other pyralid moths were the Garden Pebble whose larvae feed on crucifers, and the beautiful pink and Gold Triangle which has two distinctly different resting postures. In one, the moth adopts a ‘triangular’ shape, but at full rest, all four wings are splayed out. The larvae feed in dry vegetable matter, such as haystacks and thatch. Another pyralid, the Bee moth has larvae that feed on the comb inside bee and wasp nests. The pretty Spotted Magpie larvae feed on the young leaves of elder. Out of the swamp came the Reed Veneer which has distinctively long labial palps, it’s caterpillars feed inside the stems of common reed and reed sweet-grass. The Small China-mark is white with a distinctive row of blue-centred black dots on the hindwing. The larvae are semi-aquatic and feed on duckweed. They build floating cases made from fragments of the foodplant. And lastly the tiny Water-Veneer, has fully aquatic larvae which feed on waterweed. There are two forms of the female; one wingless, which lives under the water, and one winged. The fully-winged males mate with the females usually on the surface of the water and some of them visited our moth trap. Some notable macromoths were trapped including the Beautiful Hook-tip (again) The Dingy Shears (5) (I’d never seen one before) whose caterpillars, like the adults, are rather dull. They feed on willow. A woodland species, the Large Twin-spot Carpet. The larvae feed on bedstraw, and overwinter in this stage. The glossy surface of the wings gives rise to the White Satin moth’s English name, and the black and white striped legs add to the glamorous appearance. The larvae are covered with white heart-shaped blotches, and feed on sallow and various poplars The caterpillar of the Olive also feeds on poplars. Dark Umber was another moth we had not seen before, a large and handsome moth with a dark central cross band and distinctly scalloped trailing edges of the wings. Surprisingly when I got home to Long Eaton, there, was another Dark Umber! The moths were still coming and really we should have stayed all night. When the light was turned off at 00.30 hrs the temperature was still 15.7C but we brushed off all the moths and went home. Leader Marion Bryce and Alan Heath. It was another fine evening as we gathered everyone together at the mound of the ancient Toton Manor House where detailed notice boards illustrate the results of the 2014 archaeological dig on the site which located the structural remains and proved the location of the Manor House; investigated structural remains belonging to a mill near the basketball court; traced dry water courses relating to past water management systems and land division, including probable mill leats or races; And plotted the remains of a medieval ridge and furrow field system (for details see Toton Unearthed). This pretty much confirmed what everyone knew anyway as older people remember the old Manor Farm House which was knocked down in 1952. We continued our walk past the site of the old mill, contrasting the closely mown grass of the park with the long grass and scrub of Toton Fields Local Nature Reserve. A large hazel bush and an oak tree grew in an open area but we didn’t see any of the purple hairstreaks rumoured to be on site. By the River Erewash the path was well cleared but either side we were hemmed in by blackthorn and blackberry carelessly strewn with white bryony but with no views of the river. At the bridge we paused to look towards Toton Sidings but we didn’t see the little egret today. Walking along the ridged, recently declared although ancient footpath between Portland Road Toton and Cleveland Avenue Long Eaton we admired the standing deadwood of some old black poplars which had been lopped by Western Power for daring to grow so near the overhead wires. Tramping over the green bridge over the River Erewash overflow we could see great yellowcress, great willowherb and reed canary grass flowering in the water. We were now in Derbyshire and had come to meet our local pond dipping expert, Alan Heath, at Manor Farm Local Nature Reserve. Finding safe passage from the thistle and nettle lined path we pushed through bone dry and crackling tall tufted hair grass, meadow foxtail and timothy grass. Naturally regenerated water plants had grown in the scrape, reedmace (Typha latifolia) is choking the shallow pond which has a collar of soft rush with some compact and some hard rush. Water plantain was competing with the reedmace to fill the scrape which was dug by the Environment Agency to hold back flood water in 2016, but also to increase biodiversity in the nature reserve. The trilaterally symmetric white flowers of the water plantain which had been feeding hoverflies, bees and butterflies all day had closed for the evening. A few ringlets were still flying, then, to our amazement, Adrian found a mummified pygmy shrew. Which is a very small mammal with a markedly pointed snout. 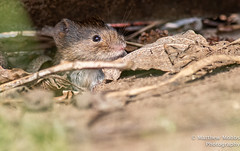 The current heatwave must have curtailed foraging opportunities for the tiny mammal which feeds on insects, arachnids and woodlice as the hard ground is impossible to burrow through. We set up the pond dipping equipment at the deeper pond, with a table and 2 chairs. The mesh nets were distributed and we set to our pond sampling with gusto. Dark brown diving beetles plunged to the sticky mud through a bubble bursting algal bloom. Skating across the surface of the water were numerous pond skaters in various stages of development and backswimmers energetically rowed under the surface film, one lesser water boatman was caught. Three white collection trays were filled with water and soon we had a haul of many toad and frog tadpoles. The lighter brown frog tadpoles glistening with gold dust. Many toadlets and froglets were hopping around at the water’s edge. The newt efts take a lot longer to complete their life cycle and they still had a frill of external gills. They. There was a strange spotty bladder snail which distinctively had a left handed helical shell. Various teeny transparent larvae were identified as phantom midges using Clegg’s Guide to Pond and Streams (BNA) and and also PS Croft’s AIDGAP book on aquatic invertebrates. The one, very small leech, looked like the invasive species Barbronia weberi. This is a successful coloniser possibly introduced by the aquarium trade and was first recorded in the UK in 1986. It co-exists with native species of leech and feeds predominantly on aquatic worms and fly larvae swallowing them completely. Impresssively large and fearsome, several dragonfly larvae looked ready to emerge from the pond. I don’t know who caught the water stick insect but it was hugely, the star of the show. It really is a very large bug and looks scarey with a long possible stinger of a tail, but this is just a breathing siphon like a snorkel, watch out for the other end! At nine thirty we packed up shop and made our way along the unofficial bridle path back to Nottingham Road opposite the Riding School, and followed the path back over two further bridges. It was still bright and light so no chance of bats today but we leaned over the bridge to think of the many otters which have passed under on their way to the River Trent. Comments Off on Would you like to go Pond Dipping with LENS? This walk started well, it was one of the best evenings, it was my birthday, the sun was shining and we managed to squeeze all of our cars into the unkempt layby on the Ingleby Road. Eleven of us snaked up the slope between the wire fence guidelines. Red and cream papery fruits of common sorrel (Rumex acetosa) and tiny sheep’s sorrel (Rumex acetosella) spangled the ubiquitous wavy hair grass (Deschampsia flexuosa). A donkey peeped up at us from the farmhouse below and soon we had a very fine view out over the Trent Valley. Since 2015 this has been subject to gravel extraction as Swarkestone Quarry continues to expand. It was a great spot for birdwatching, swift, goosander and cormorant were spotted from our great height. Great oaks formed a parade along the edge of the sandstone escarpment, drunken bluebell (Hyacinthoides non-scripta) stems lolled, swollen with green fruit barrels. As we followed a mountain goat path (with missing parts) clinging to the side of the sandstone cliff we could admire wood sage (Teuchrium scorodonium) and the coppery forking flowers of great woodrush (Luzula sylvatica) which leaned over the calamitous precipice. It was a slippery slope down beneath large lime trees to the banks of the old River Trent. We relaxed as white flowers of river crowfoot sashayed in the river water flow with yellow plastic cups of water lily (Nuphar lutea). Marsh marigold (Caltha palustris) and water forget-me-not (Myosotis scorpioides) crept out of ancient stones. Banded agrions formed an archway of great clubrush (Luzula sylvatica), to a swan’s nest. A bright red cardinal beetle was photographed as shining green dock beetles skeletonised broad leaved dock leaves. Meadow rue (Thalictrum flavum) was spotted but also of the unwelcome alien, Himalayan balsam (Impatiens glandifera), there was plenty. The tuneful garden warbler contrasted with the Cetti’s staccato insistence. Then stepping stones helped us across the last obstacle to the Grade II listed religious site. The Anchor Church is a series of caves which have been extended by human intervention to form a crude dwelling place, complete with door and window holes. The name is derived from the term anchorite (meaning to withdraw into the countryside) because it is thought to have been the cell of St Hardulph, a hermit, in the 6th century. In the Middle Ages, the caves were used by a monk named Bernard, doing penance. Records of the caves exist from 1658 when it is mentioned in Repton church records. Sir Francis Burdett of Foremarke Hall enlarged the caves in 1865, fitting a door and a set of steps to the main entrance, forming part of the romantic landscape of Foremarke Hall and its park. Thank you Wikipaedia. A spike of creamy flowers growing out of the rocks from a rosette of succulent green, dimpled round leaves, was wall pennywort (Umbilicus rupestris) also known as navelwort, it is a rare plant in Derbyshire. We didn’t try to fish for the shining pondweed (Potamogeton lucens), which lurks in the swift flowing brown backwater channel below the rocks. All was good, we enjoyed exploring the caves and we really should have continued to walk back along the road but, we decided to walk back along the top of the escarpment. The path which had been so obvious a few weeks previously was now rough ploughed and over grown, was it just a common path? Evening scents are strong, we pushed through bracken and foxglove, along a field edge with arable weeds, chamomile (Anthemis cotula), field pansy (Viola arvensis) and field forget-me-not (Myosotis arvensis), back to the lime trees to repeat our outward adventure. We had a mutiny and three of our party made their own way back along the top fields. There were stumbles and mumbles and a nuclear explosion of a sunset as we waited for the whole party to reassemble and 11 of us returned home safely. But have we still got 11 members? Comments Off on Would you like to go on a LENS Walk?